Welcome 2018 in a triumphant celebration with Salute to Vienna New Year’s Eve Concert at State Theatre New Jersey on December 31. 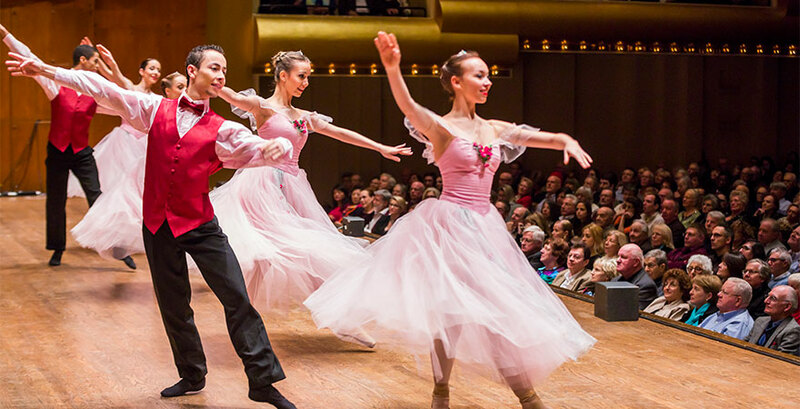 Featuring a popular blend of classical music, delightful costumes, humor, and dance, this Viennese musical experience is a festive tradition to ring in the New Year. 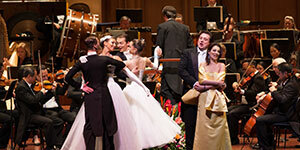 The stunning program led by world-renowned conductor Bernhard Schneider includes a full orchestra, acclaimed European singers, and Europe’s finest ballet and ballroom dancers. Salute to Vienna is a re-creation of Vienna’s beloved New Years’ Concert, or Neujahrskonzert, that has delighted audiences for 80 years. Performed annually by the Vienna Philharmonic, the Neujahrskonzert celebrates the music of Johann Strauss, his three sons, and their contemporaries. The concert is broadcast around the world, with 1.5 billion viewers from over 90 countries turning in to enjoy the televised performance. The concerts’ international popularity is attributed to the timeless appeal of the spirited and creative music of Vienna’s most beloved composers. The spirit of Neujahrskonzert comes to New Brunswick with Viennese conductor Bernhard Schneider and The Strauss Symphony of America, who will perform with soprano Micaëla Oeste, tenor Tilmann Unger, members of the Kiev-Aniko Ballet of Ukraine, and International Champion Ballroom Dancers. The musical program weaves energetic overtures, beautiful waltzes, and spirited polkas with memorable selections from favorite Strauss operettas Merry Widow, Die Fledermaus, and Gypsy Princess. Exquisitely costumed ballet and ballroom dancers delight the audience with vignettes of romance, humor and adventure that they present on stage. In keeping with tradition, the concert ends with the audience jubilantly clapping along to the "Radetzky March." Salute to Vienna treats audiences to an evening of fun, glamour, and romance. State Theatre New Jersey welcomes Salute to Vienna New Year’s Eve Concert back for a 12th year on December 31, 2017 at 6pm. Usher in the New Year with this enchanting tradition!